Beatrice Chebet clinched the junior gold medal at the IAAF World Cross Country Championships in Aarhus Denmark on Saturday in a dramatic win. The officials at the finish line had given the Ethiopian duo of Alemitu Tariku and Tsigie Gebresalama Gold and silver titles respectively, placing Chebet at third place after a close photo finish at the tape. However, a relentless Chebet appealed the result and the officials reviewed the finish to determine the winner. According to the review, Chebet actually won the race via microseconds, clocking 20:50 downgrading Tariku who was second and Gabresalama who came in third. ALSO READ Video:See How Embu Governor Martin Wambora was kicked out..
Chebet becomes the first Kenyan to win the race since Faith Kipyegon did so in Bydgoszcz, Poland in 2013. The last two editions in Guiyang China and Kampala, Uganda were won by Ethiopians. Elsewhere on social media, Kenyans expressed their disappointment with IAAF questioning how such a costly mistake could occur in the glaring watch of live cameras. 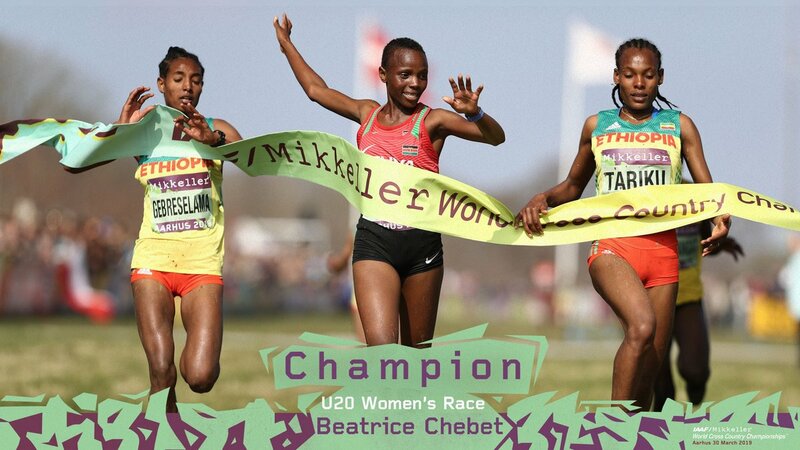 Sports personality Carol Raul tweeted, “So Kenya Beatrice Chebet wins the Women’s U20 race; she is placed 3rd by IAAF who then review their decision and give her the gold”. Another tweep, @dianawenwa_ tweeted, “It’s so sad that such a big even lack finish line technology. I expected something of that sort. But we won anyway. Though a bad team selection from Kenyan side”. Muneeni Muthusi tweeted, “she clearly had won the race whoever came up with the idea of giving it to Tariku was insane”. Musya Ngei tweeted, “we’re proud of you. Kudos. They can’t steal our victory“. Alemitu Tariku, Beatrice Chebet and Tsigie Gebresalama show off their medals. Later in the day, Kenya’s Hellen Obiri also reigned supreme in the Women’s Senior Race clocking in 36:14 ahead of Ethiopia’s Dida at the IAAF World Cross Country Championship in Aarhus, Denmark. This makes her the first athlete to win a world Indoor title , World Outdoor title and World Cross Country title.